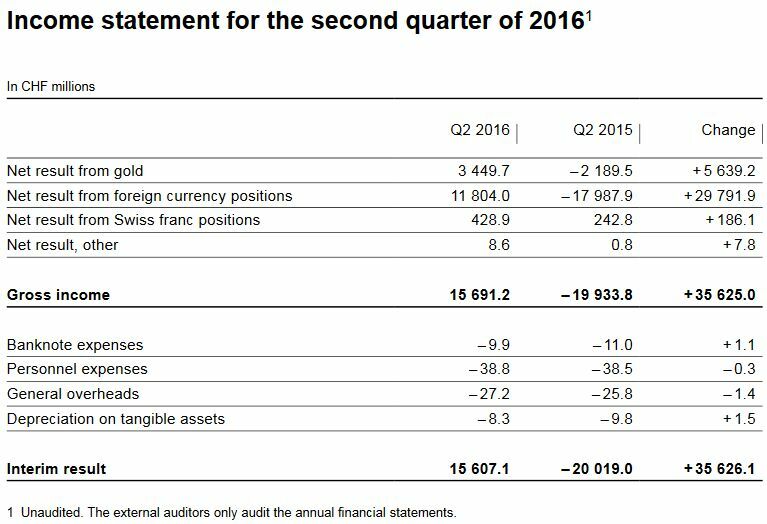 The Swiss National Bank (SNB) reports a profit of CHF 21.3 billion for the first half of 2016. 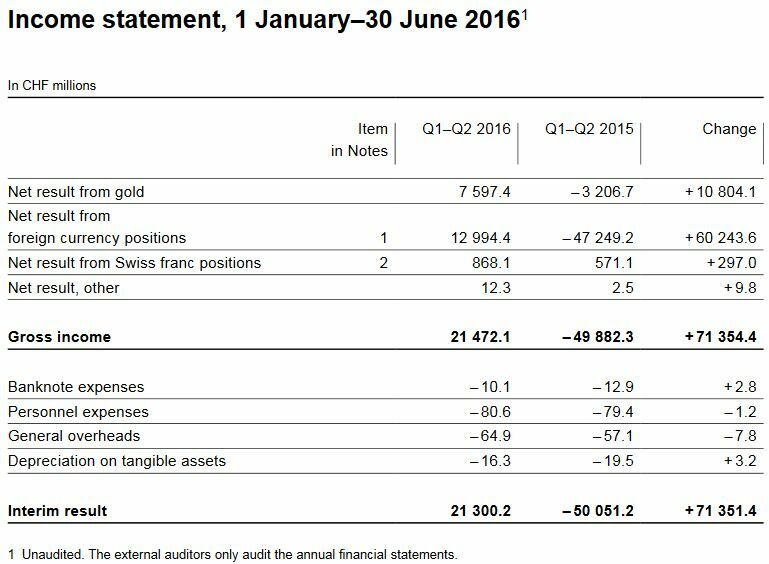 A valuation gain of CHF 7.6 billion was recorded on gold holdings. The profit on foreign currency positions amounted to CHF 13.0 billion. 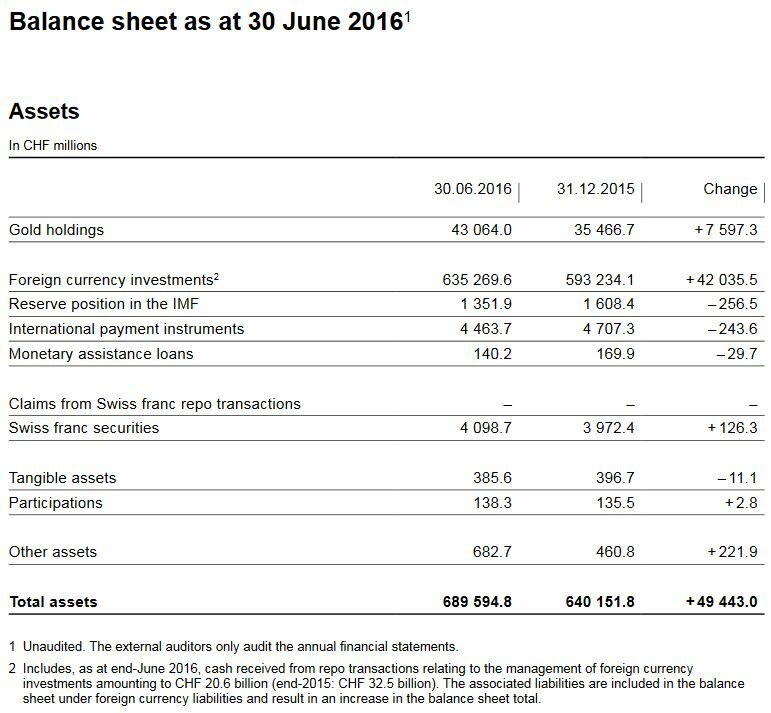 The net result on foreign currency positions amounted to CHF 13.0 billion. Interest income accounted for CHF 4.1 billion and dividends for CHF 1.7 billion. Movements in bond prices differed from those in share prices. The generally lower interest rate level resulted in price gains of CHF 10.3 billion on interest-bearing paper and instruments. By contrast, a loss of CHF 0.2 billion was recorded on equity securities and instruments. Overall, exchange rate-related losses amounted to CHF 2.9 billion. A valuation gain of CHF 7.6 billion was achieved on gold holdings, which in volume terms have remained unchanged. Gold was trading at CHF 41,408 per kilogram at end-June 2016 (end-2015: CHF 34,103). The balance sheet has expanded by over 49.4 bn. francs by 7.66%. 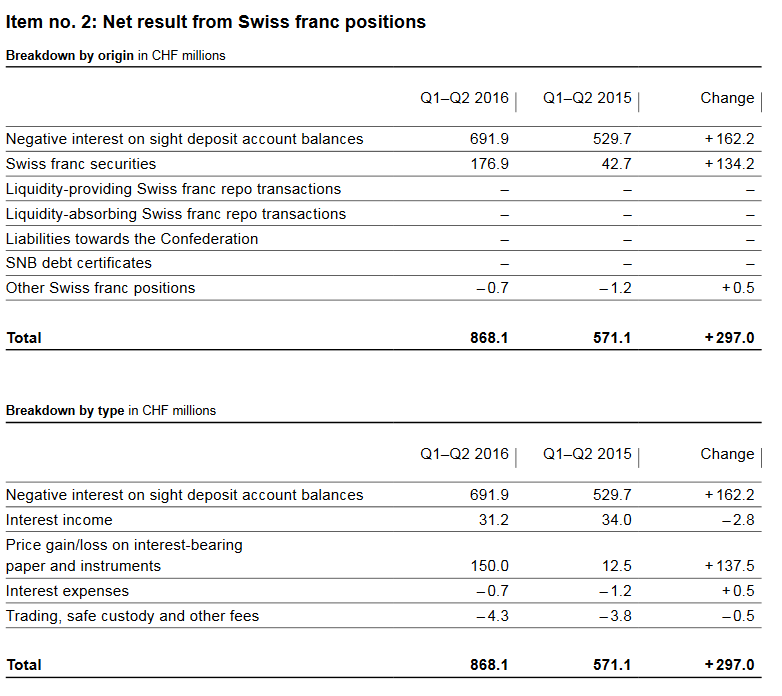 The profit on Swiss franc positions, which totalled CHF 868 million, essentially comprised CHF 692 million of negative interest charged on sight deposit account balances since 22 January 2015, price gains of CHF 150 million and interest income of CHF 31 million on Swiss franc securities. 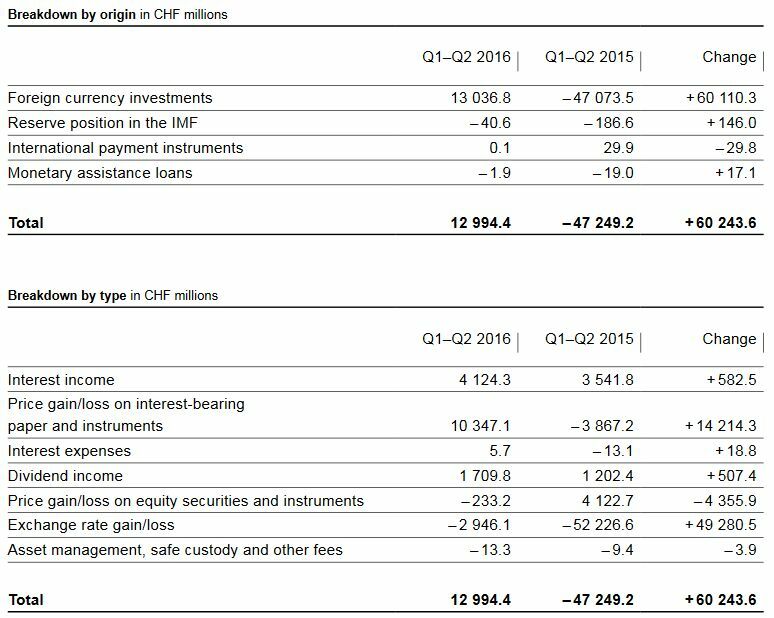 As at end-June 2016, the SNB recorded a profit of CHF 21.3 billion, before the allocation to the provisions for currency reserves. In accordance with art. 30 para. 1 of the National Bank Act (NBA), the SNB is required to set aside provisions permitting it to maintain the currency reserves at the level necessary for monetary policy. The allocation for 2016 will be determined at the end of the year. The SNB is a special-statute joint-stock company with head offices in Berne and Zurich. These interim results have been drawn up in accordance with the provisions of the NBA and the Swiss Code of Obligations (CO) as well as the accounting principles detailed in the notes to the annual financial statements as at 31 December 2015. These results present a true and fair view of the financial position and the results of operations of the SNB. Unless otherwise stated, the accounting principles are based on the Swiss GAAP FER standards (Accounting and Reporting Recommendations). Departures from Swiss GAAP FER occur only if an accounting principle runs counter to the provisions of the NBA or if the special nature of the SNB needs to be taken into account. In a departure from Swiss GAAP FER, no cash flow statement has been prepared. The structure and designation of the items in the balance sheet and the income statement take into consideration the special character of the business conducted at a central bank. Compared with the annual financial statements as at 31 December 2015, there were no changes to the accounting and valuation principles. 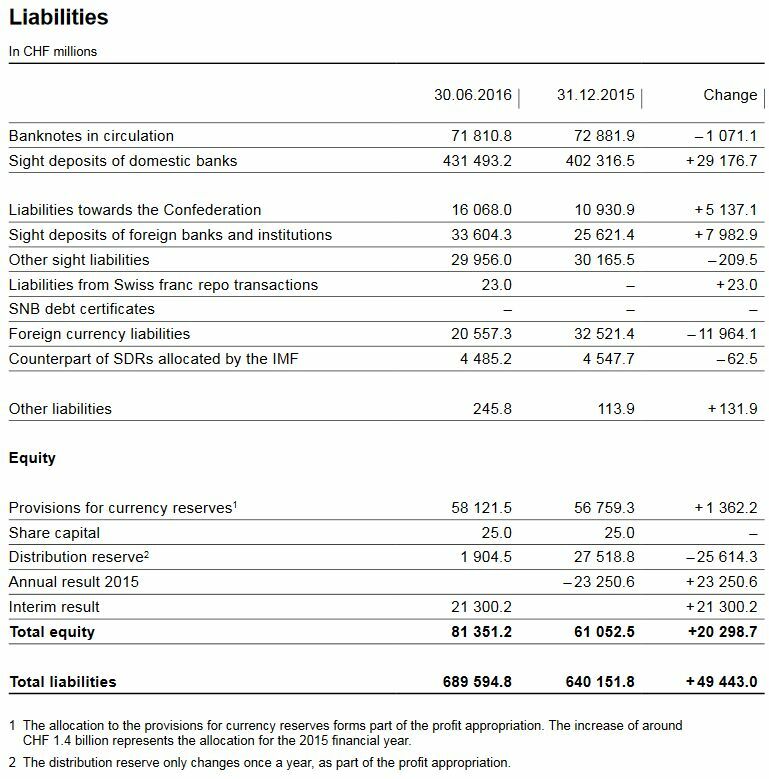 The SNB interim results as at 30 June 2016 constitute an interim report in accordance with Swiss GAAP FER 31, with condensations in presentation and disclosures. Swiss GAAP FER 31 requires the presentation of earnings per share. This has no informative value in view of the special statutory provisions for the SNB. Shareholders’ rights are determined by the NBA and their dividends, in particular, may not exceed 6% of share capital (with a nominal value of CHF 250 per share, a maximum of CHF 15); the Confederation is entitled to one-third and the cantons to two-thirds of the remaining distributable profit. Therefore, no presentation of earnings per share is made.